These lush terrarium necklaces were inspired by the pageantry of the changing seasons. Inspired by her extensive travel by land and sea, jewelry designer Catherine Weitzman expresses her love of nature through art, design, and fashion. 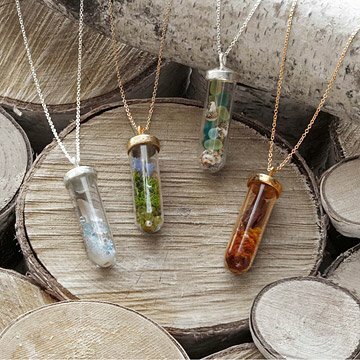 These seasonal terrarium necklaces allow you to carry your favorite time of year with your in lustrous organic style. Filled with a lush array of dried greenery, semi-precious beads, and more, each sterling silver or 18K vermeil-capped tube encapsulates the essence of spring, summer, fall, and winter. Handmade in Hawaii. Catherine Weitzman draws her inspiration from her innate sense of organic style, her love and respect for the ocean, and her extensive world travels. She's had the good fortune to study first hand with traditional artisans from many parts of the world. In addition to apprenticing with metalsmiths at the Scuola Lorenzo di Medici in Florence, this group of mentors includes silversmiths of the Sahara, bamboo whittlers from Indonesia, and creators of precious metal clay in Tokyo. Drawing from each of these experiences, Catherine developed her own unique process and production style. She designs much of her work with her husband, Scott Diamond, and collaborates with an extremely gifted handmade production team in their California and Hawaii studios. Unique impressions of the colors, textures, and moods of the seasons, Catherine Weitzman's necklace designs represent the unique character of spring, summer, fall, and winter through elegant arrangements of semi-precious stone beads, moss, shells, and other natural materials, captured in glass capsules. Catherine Weitzman pays employees a starting wage of $15/hr., which exceeds Honolulu County's living wage. Their PTO policy depends upon length of employment and status (full or part-time). All employees start with a minimum of 2 weeks PTO and accrue more time off based on the length of their employment and their evaluations. The company is also flexible about granting more unpaid time, as needed. PST is also granted as needed. They recycle all of their metal, separating "clean metal" (which just gets re-melted) from "dirty metal" (i.e. metal that's been soldered), which gets refined. The company does not formally track their charitable giving, but meets all our other criteria for responsible business practices. Sterling silver, peridot, dried flowers, apatite, borosilicate glass, cubic zirconium, quartz, 18K gold vermeil, and dried moss—all natural source materials. The Seasons Terrarium Necklaces are packaged in 100% recycled cardboard boxes (made with 90% post-consumer fiber and 10% pre-consumer fiber), covered with recycled paper. The boxes contain anti-tarnish poly-fill. Silver: to maintain the matte finish, rub lightly with gentle steel wool or scotch brite, or clean with an old toothbrush and any white toothpaste. Vermeil (gold plate): gently clean with any mild soap or dish detergent, and dry with a soft clean cloth. Very disappointed with the product. My wife just opened it, and it looks nothing like the photograph. I ordered the spring version, and the there is a tiny terrarium stuck to the top of the pendant (nothing like the color in the photograph), and a few colored beads in there. More than half of it is empty and when worn, all you can see are the beads. I bought the Summer as a Christmas present for my Wife who is a beach person. She is either getting really good at looking ecstatic when opening presents or she really liked it. When I opened it I was surprised by the size of the pendant, in the pictures it looks smaller. The chain that it came with is long but rather thin for a pendant this size, that is just my opinion though. Overall a very nice piece of jewelry. Just not worth the money!!! poorly made and garbage like.I didn't even give to the person I thought would love it. It was real garbage. I ordered the summer terrarium for me and when my best friend saw it she had to have one too. It's like wearing a little piece of the beach, which is a comforting reminder in winter or hip to wear to a summer party. I sometimes wear it alone, or since it's a longer length I will wear it with a shorter complimentary necklace. Whenever I wear it, I get compliments. Unique product, but chain so tangled and knotted, it had to be cut and another chain used. I purchased the winter necklace for my wife and it more than exceeded my expectations. It was packaged perfectly and so beautiful. She absolutely loved it. I will definitely recommended you guys to everyone and will absolutely be back for more purchases. Thank you for helping me make her birthday special. Gave the Winter and Summer necklaces to my daughters for Christmas (the seasons of their birthdays). They both loved them. The Summer terrarium is absolutely beautiful. The Winter represents the season very well (it's mostly white) - a few more blue stones would give it more color and still represent Winter. That said, it is still very pretty. The necklaces are very unique and they look great with sweater or a t-shirt. I bought this necklace for my wife because I've never seen anything like it before. She really enjoys it and it looks very professionally assembled. The chain is a little long but that's easily fixable. Was notnas pictured in book, a big let down. I returned necklace. It was for the girlfriend of my son, who has a master's degree in biological anthropology, and her latest obsession is terrariums, so this gift was perfect. She found it delightful and put it on right away, being the perfect length for wearing.